The busyness of summer has taken a toll on our house and our garden, but we're getting caught up again. We spent a couple of weeks sick with a summer cold, and that turned into an ear infection for the baby. When we finally got that bug out of the house, we were left with a house that looked like a tornado had gone through, with clean clothes and dirty clothes in piles all over the place. So we washed everything again and got the laundry caught up. Then we got the house clean and back in order. Just in time for Eowyn's birthday celebrations and a visit from Jeremy's parents. This week things are back in order in the house, so we've been heading outside to get the garden back in order. I really need some hay for a deep mulch. I know of some I can have, and it's perfect because it's already a couple of years old, and it's several bales. But the menfolk are convinced I'm crazy for wanting to put hay down. (Here's where Quinn does it, and here's where Jill does it too.) I guess I'm gonna have to figure out how to drive the tractor myself. Actually, if I climbed up in my Dad's tractor to turn it on myself, I bet my Dad and Jeremy would get that hay loaded for me real quick. Anyway, the kids and I spent the morning in the garden digging out the potatoes and getting the weeds around the potatoes out too. What a mess, I know. I'm sorry. I'm a sorry gardener. We've been digging up potatoes for about a month now, just as we needed them for dinner. I love yukon golds, and these taste amazing. (I ordered the seed potatoes here from Amazon, and here's the post describing how we planted them.) Creamy and buttery goodness. We pulled up the north side of the garden in June, and none of those plants did very well. They all produced at least 4 potatoes, but they just didn't seem to thrive as well as the south side of the garden.The south side's potatoes are huge and each plant has had 6-7 spuds underneath it. Maybe I'll plant the potatoes along the south side from east to west, instead of north to south next year. We got about half of the digging out done before Noemi was done. She got a little cranky and ready for a nursing break. 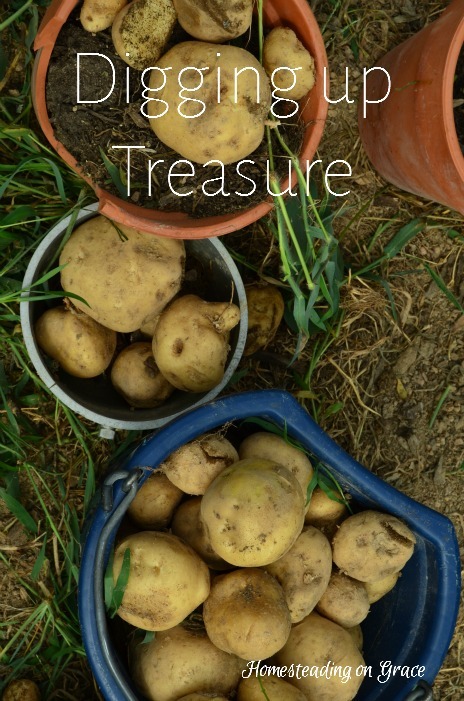 Digging up potatoes is the best thing to harvest, it's just like digging up treasure, but boy, do you get dirty. Afterwards, I let the kids play in the hose to cool off and wash off. And they played with bubbles, so, you know, baths were done! But that water was way too cold for me and Noemi. Well water is cold, cold, COLD. I think we collected about 20 pounds so far. I'm hoping we'll get the rest done tomorrow. What are you harvesting right now? Lovely potatoes! I have volunteer potatoes everywhere, but haven't dug any up this year. One more box of last year's and then we'll be digging too. Have you ever planted purple potatoes? So hard to see when you dig them up--which is why we have volunteers everywhere I assume :-) . I haven't tried purples, to grow or to eat. It's on my list though! I have grown sweet potatoes, and last year they were terrible, the time before that, we had so many huge sweet potatoes. It was awesome. I love potatos. I planted some purple ones I ordered from Burpee. So good with green beans. I love digging them up. So fun! Everyone's talking about purple potatoes, I'm adding it to my list for next year! Right now, I'm harvesting zucchini and bell peppers, but they are small. The zucchini I will keep harvesting, but the bells, I think I'll leave for a bit. Your potatoes look great! Visiting from The Art of Homemaking Mondays. We're getting bell peppers too, but our zucchini plants are done. Kind of glad though, we had so much! Some are better than none! I pray you find unexpected treasures when you dig, Gwen! I'm going to start stalking all of your aquaponic posts soon Terri. I need to figure out what all we can grow in an aquaponic system, and I did not know we could grow beetroot. Thanks! Exactly, Yukons are so delicious! And you're right about the nature studies. Gideon and I watched some red ants attack a beetle. Now that was exciting! Not to mention all the toads Gideon kept trying to save from my hoe. He almost lost a hand or a head trying to save the toads. He's definitely got his priorities straight. Yukon potatoes are do delicious! Thanks for sharing your post on Our simple Homestead Blog Hop! Sadly my seed potatoes molded so I didn't get them in the ground. It looks like yours did wonderfully though! That's awesome! Thanks for linking up with Green Thumb Thursday. We hope you'll stop back this week!